OnePlus 6T's full specs have been leaked - or have they? An online retailer has posted a pre-order page claiming to list all the details on the upcoming OnePlus 6T, release date included. it describes a device with a teardrop notch, the Snapdragon 845 and triple cameras. 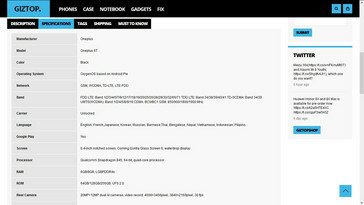 However, some details on this 'leak' do not add up. An online retailer has posted a pre-order page for the next OnePlus flagship, the 6T. The page makes numerous claims that many Android fans may find welcome. 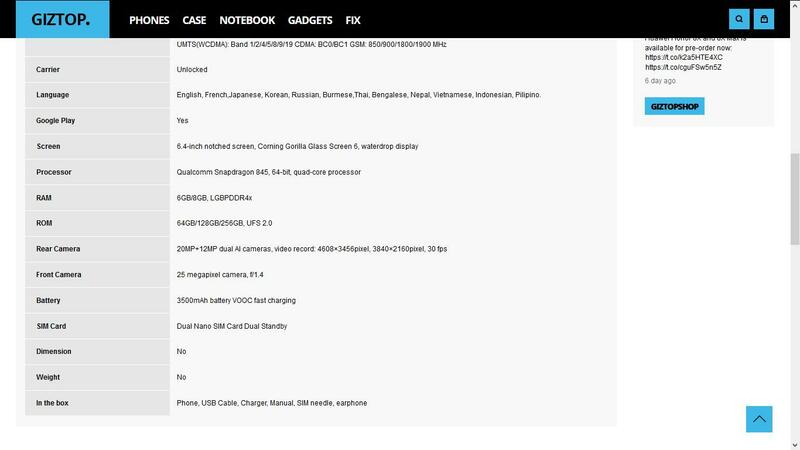 On the other hand, the ‘specifications’ section of the page contain possible clues that it may not really reflect how the 6T will look or perform. 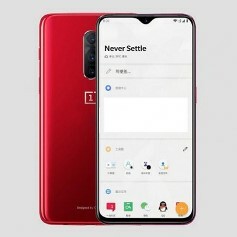 The pre-order page, listed by the online seller GizTop, claims that the OnePlus 6T will have a screen with the teardrop notch seen in phones such as the Oppo F9. This may give it an improved screen-to-body ratio (which the page puts at 91.5%). On the other hand, the resolution of this screen has been set down as 2340x1080 (or a pixel density of about 402), which at this stage in OnePlus' flagship-selling career, distinctly looks like settling. In better news, the 6T is apparently to be powered by the Snapdragon 845, and with 6 to 8 GB in RAM, as with the OnePlus 6. GizTop also claims that it will come in storage varieties of 64 to 256 GB (again, like the 6). Equally unsurprisingly, the phone will come with Android Pie 9.0 out of the box. However, this is where the similarities end. According to the page, the 6T will also come with an in-display fingerprint sensor. Then again, this detail has been officially corroborated by OnePlus; it will be called Screen Unlock. 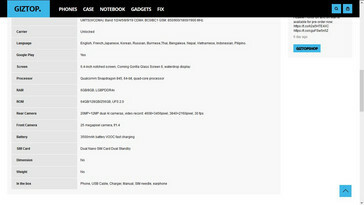 However, the company did not mention the triple camera also listed in the pre-order page. This is made up of a 20- and 12-megapixel, AI-powered dual module, augmented by an innovative time-of-flight (TOF) sensor for three-dimensional image capture. The 6T will also apparently have a larger battery compared to the 6. The latter two points of interest is, unfortunately, where the veracity of the page falls down a bit. These features (even down to the 3D TOF camera) are also found in the OPPO R17 Pro. Therefore, it appears that GizTop has made a specs chimera of the 6T's definitive attributes (e.g. Screen Unlock) and those of the R17 Pro's. This impression is supported by the fact that the battery info is accompanied by the phrase "VOOC fast charging". VOOC is an OPPO trademark; this may be a critical slip-up in creating the page as a convincing OnePlus leak. On the other hand, it is common enough practice for online retailers to post pre-order pages well in advance, whether they have viable device information to include in them or not. The page also mentions a release date in October, which is in line with other reports. Finally, the page suggests that different SKUs of the 6T will cost a little more than those of the 6 before it. > Notebook / Laptop Reviews and News > News > News Archive > Newsarchive 2018 09 > OnePlus 6T's full specs have been leaked - or have they?